Already own a home in the Volanta subdivision? Thinking of selling? Click here and read about current search trends & our web network. 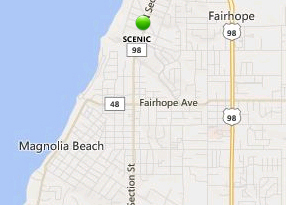 Volanta homes in Fairhope, AL are centrally located in the heart of Fairhope. The homes in Volanta are near the Fairhope Yacht Club and Fly Creek Marina. The Volanta subdivision is one of the oldest neighborhoods in all of Fairhope. The Volanta homes consist of numerous styles typically from two to four bedrooms and start around 1,100 square feet. Many of the lots in Volanta are heavily wooded and provide plenty of privacy. As with may homes for sale in this area, underground utilities and natural gas is available. Please let us know if you would like further info on the Volanta subdivision or any other homes, condos or real estate in the area or would like to schedule a private viewing by emailing info@condoinvestment.com or by calling 251-Area-Pro (251-273-2776) for immediate assistance.